ORCHARD PARK, N.Y. (AP) — After a poor first half of the season, the Buffalo Bills are in position to close the season on a roll. Following a 24-21 win over Jacksonville on Sunday, the Bills (4-7) have won two straight and shown noticeable improvement in recent weeks. Though a return to the playoffs may be far-fetched, four of Buffalo’s final five opponents have losing records — which puts the team in position to show its recent run is no fluke. “It’s about us growing and developing a strong foundation and the culture that we want and doing things the right way, creating a mindset,” Bills coach Sean McDermott said. A strong finish to the season would go a long way in providing McDermott and general manager Brandon Beane validation with their youth movement. The biggest change in recent weeks has been the uptick in production on offense. For the first time this season, the Bills have scored 24 or more points and topped 300 yards in back-to-back games. Journeyman quarterback Matt Barkley first breathed life into the offense, throwing for 232 yards in a 41-10 win over the New York Jets. 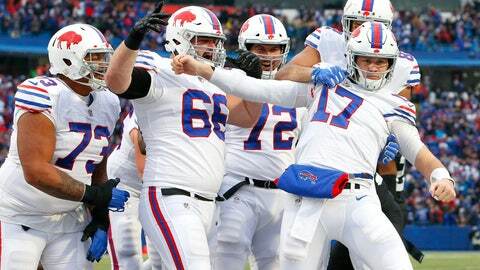 The upswing continued in rookie Josh Allen’s return to the lineup after the QB missed four games with an elbow injury. On Sunday, Allen threw for 160 yards — which included a 75-yard touchdown pass to fellow rookie Robert Foster — and ran for 99 yards, establishing a franchise record for rushing yards by a quarterback in a game. Foster and Isaiah McKenzie have provided a jolt to the Bills passing game, adding some much-needed speed to open things up on offense. While promising, the Bills still have plenty to clean up offensively. Aside from the long touchdown pass, Allen completed seven throws for 85 yards against Jacksonville and had other big gains wiped out by penalties. Penalties were an issue for both teams; Buffalo finished with 13. Buffalo’s run defense was also vulnerable against the Jaguars. The Bills allowed 95 yards and two touchdowns to Leonard Fournette on 18 attempts before Fournette was ejected late in the third quarter following a scuffle. The Bills grabbed the upper hand following Fournette’s skirmish with defensive end Shaq Lawson — which they felt was more than just a momentary boost. Buffalo’s next opponent is the Miami Dolphins (5-6), who have lost four of their past five games.